The KLUBB KIDZ/JWL/JORDAN FIELDS/DJ WITH SOUL All That Jelly Vol 2 vinyl at Juno Records. Smile for A While is a collective of nightlife addicts, DJs and producers from Frankfurt & Berlin. 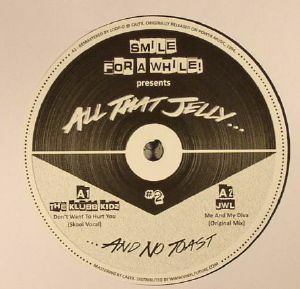 They present All That Jelly Vol 2: music by well-established producers but also from lesser known guys; namely remastered gems from the 1990s. Every tune has its own story and is more than worth the pressing. Running a party and a label of the same name, they want to make people smile with good music and vibes. Fair play! First up are the Klubb Kidz: a short-lived project by Peter Primiani and Tyrone Solomon. They give us the classic, early '90s NYC vibes of "Don't Want To Hurt You" (Skool vocal - remastered) which shows us their best Kerri Chandler impression. Chicago's finest Jordan Fields shows us how it's done, as always, on his brilliant groove entitled "Everybody Swingin'" (The Rapture Of dub - remastered) until finally JWL gives us "Me & My Diva" (original mix) for your fix of classic, soulful vocal house.